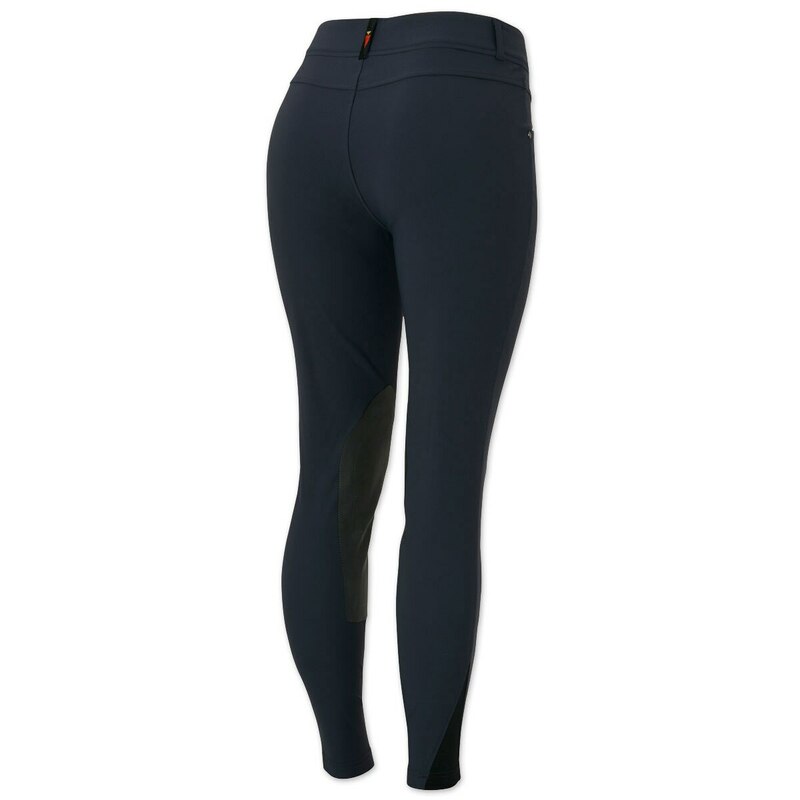 Kerrits Cross-Over Knee Patch Breech - Clearance! Where performance meets design! Kerrits Dynamic Extreme™ fabric technology, sport-specific R&D, and precision fit have all gone into the development of this new breech. 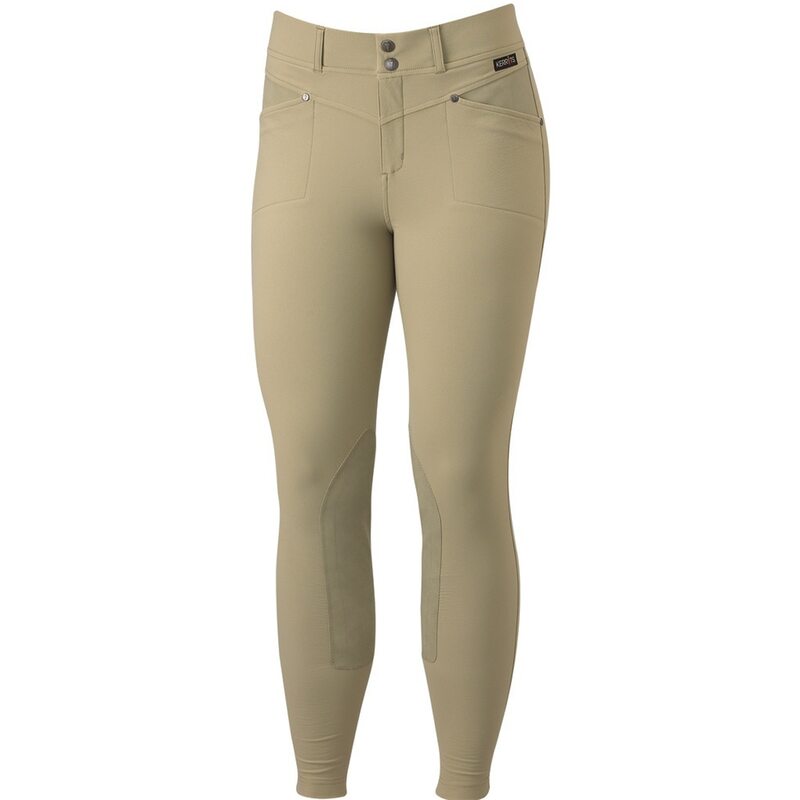 The Kerrits Cross-Over Knee Patch Breech has a traditional silhouette and is detailed with flattering pocket seaming and a tailored front-fly construction. 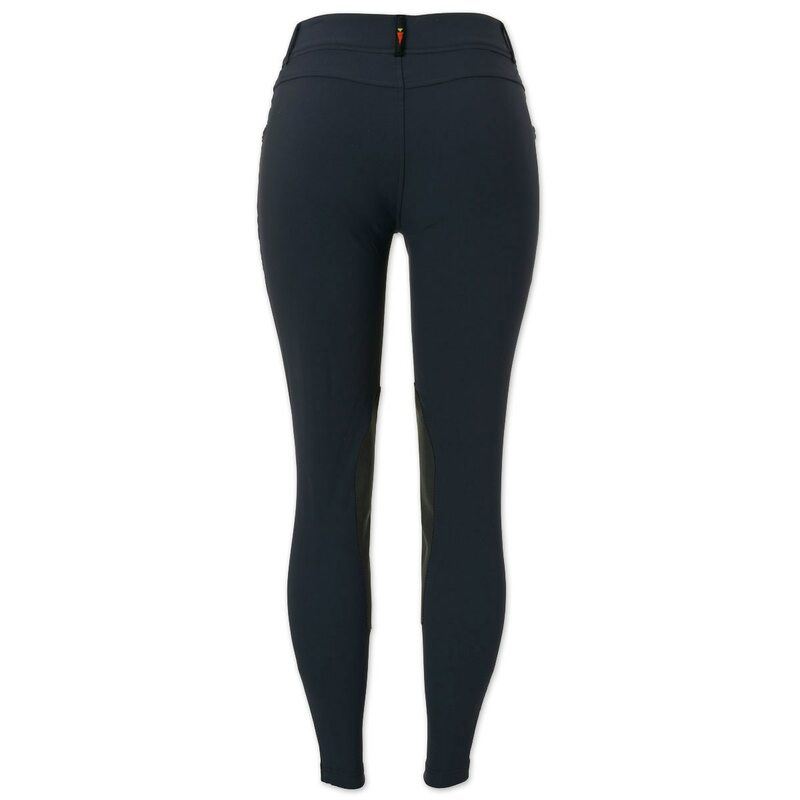 Internal elastic at the waist provides comfort and gentle support. Breech Material: 92% Nylon. 8% Spandex. Breech Material 92% Nylon. 8% Spandex. Patch Material 47% Polyester. 53% Polyurethane. 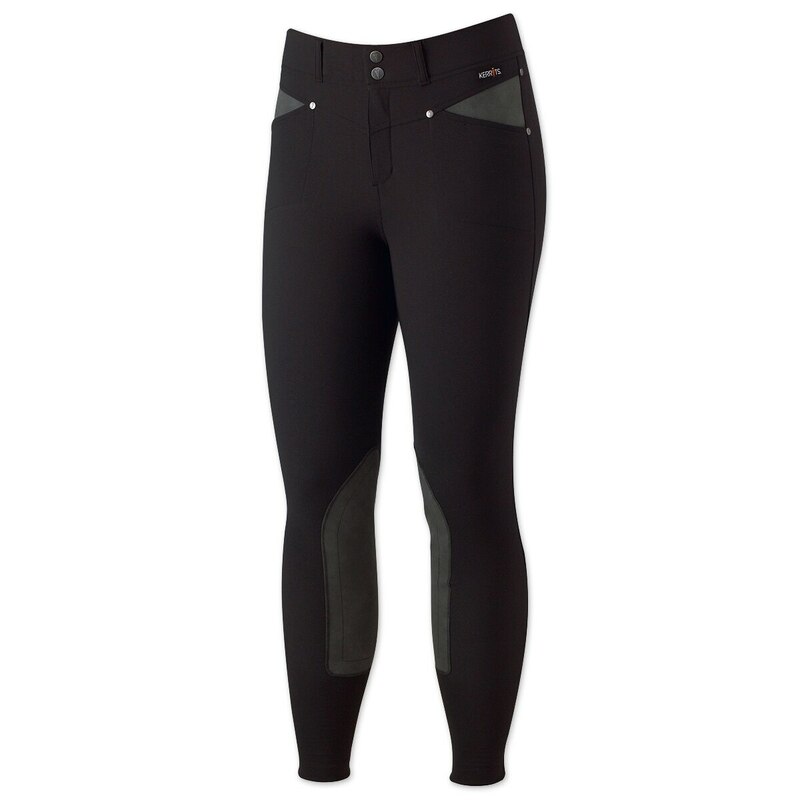 Kerrits Cross-Over Knee Patch Breech - Clearance! is rated 4.4 out of 5 by 40. Rated 5 out of 5 by tmd218 from Great value and good for those with small waists This is my 3rd pair of these. I've gotten three colors because I LOVE the way these fit. I have a traditional hour glass figure with a small waist and bigger hips, and usually breeches gap at the back or straight up don't fit. I also prefer a higher waist, and these tick all the boxes. The colors available are fashionable without being garish, and the calf sock fit is terrific without any bunching. The one change I've made (which I've noted on reviews for other colors) is the material at the knee patch. At the knee patch, something happens where there is basically no air circulation, so it gets VERY sticky if it is particuarly hot out. I'd pay double the price to get this exact fit without the sticky-knees in hot weather, but for the price it's an issue I can live with (and do--I've got three pairs now!). I've now had my original pair in acorn brown (bring back that color!) for well over a year and they're holding up GREAT. The fabric tends to shed dirt/hair, and stains largely don't stick through a washing. Rated 3 out of 5 by demicent from The Waist Fits!!! 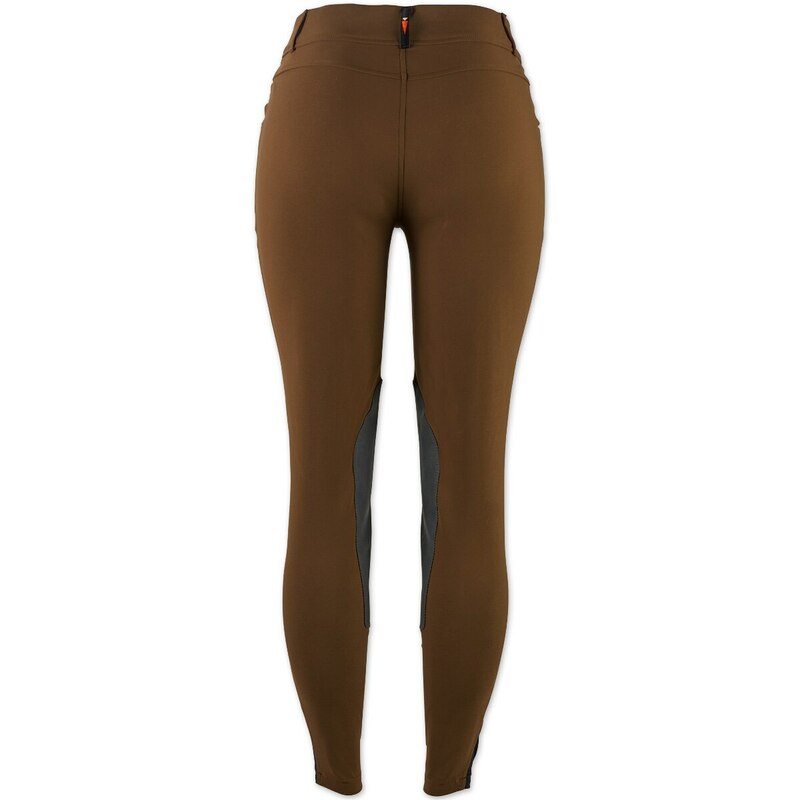 I needed buff/tan breeches in a hurry for an informal foxhunt, and purchased these in a size XL. I am five feet tall and currently 140 pounds. This is the first pair of breeches that I have ever tried on that does not gap in the back of the waist! The leg length is a bit longer than some other brands, but the calf/ankle material is soft enough that bunching it up to fit in my tall boots does not cause chafing. I have wide calves and the material fits well without binding. The belt loops are large enough for my 1 1/2 inch belt. The interior seams lie nicely and do not rub. The fabric breathed nicely here in our South Carolina summer. The fabric is a little cheap looking, but for schooling and informal events it is fine. The knee patches are a fairly stiff cardboardy material, but I didn't notice any rubbing. My main complaint with these breeches is the staining. Both the main fabric and the knee patches picked up black from the inside of my boots and a brown dirt smudge from a horse. I washed them according to directions and the stains remained. So I scrubbed some detergent and Oxy into them, and the second wash was not much better. NONE of my other breeches have ever picked up and failed to release stains like these. I am giving these three stars because I like the mid-rise profile and good fit in the waist. I am very short waisted and they fit perfectly with no gaps. 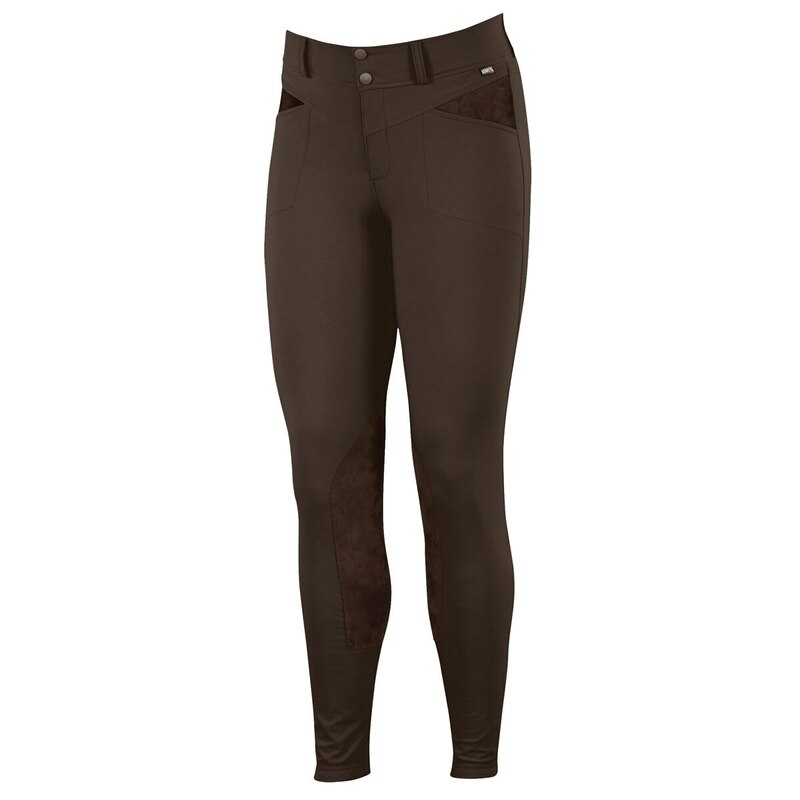 I am not fond of the material in the main body of the breeches, it reminds me of parachute nylon. It is nice and stretchy and non-binding, though, but I don't think it looks traditional enough for the show ring or a formal season hunt. The knee patch material was a bit stiff and creased up into big wrinkles, although it did not rub. 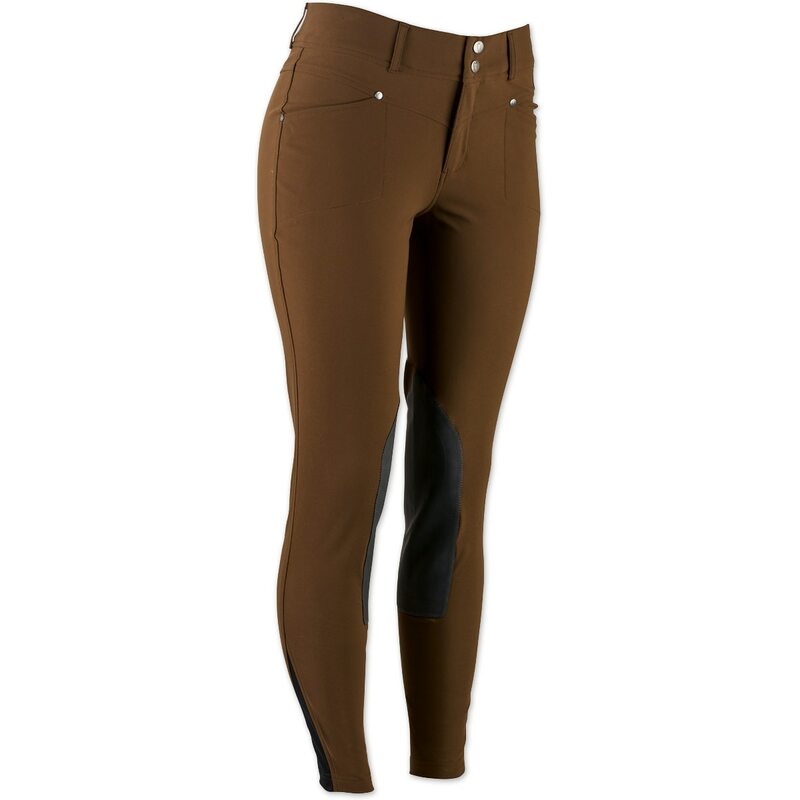 I will use these breeches for schooling only because of the material and the staining, and be glad I don't have to wear a belt, due to the great fit. Rated 5 out of 5 by redhorse from Great for summer Lightweight fabric great for our hot, humid summers. Rated 1 out of 5 by Janet from I had to return these. The material felt very durable, but was too stiff for me and made it uncomfortable at the knee bend. 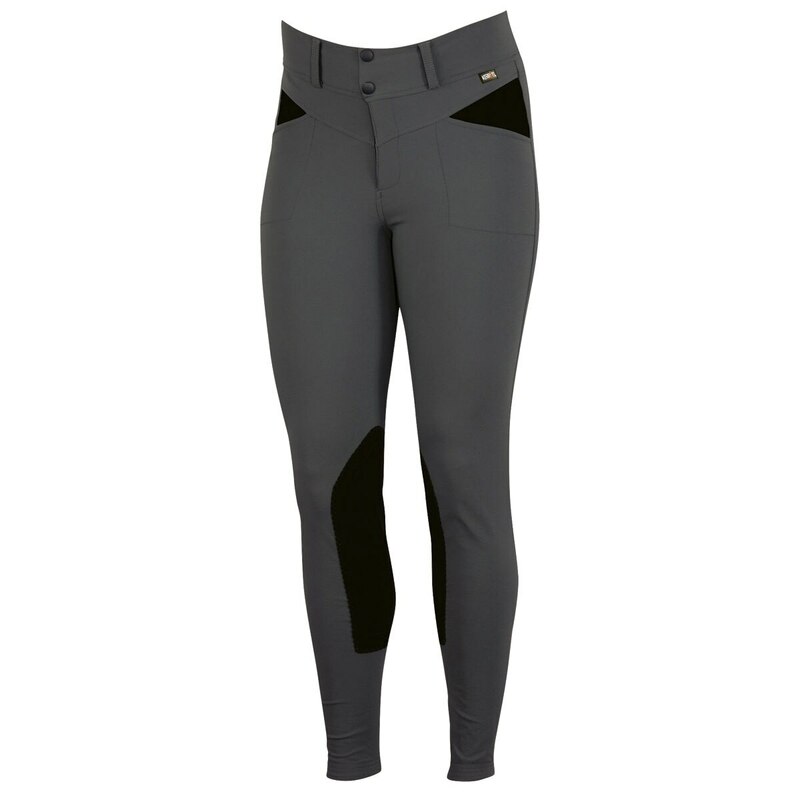 Rated 5 out of 5 by Allie150 from Love these breeches! 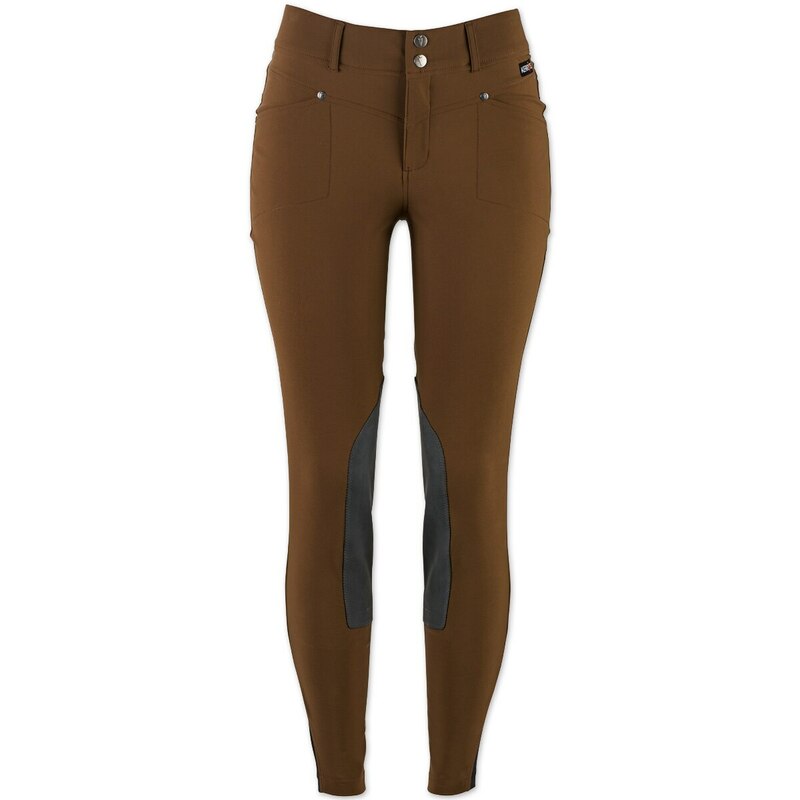 I got these breeches about a month ago and love them! 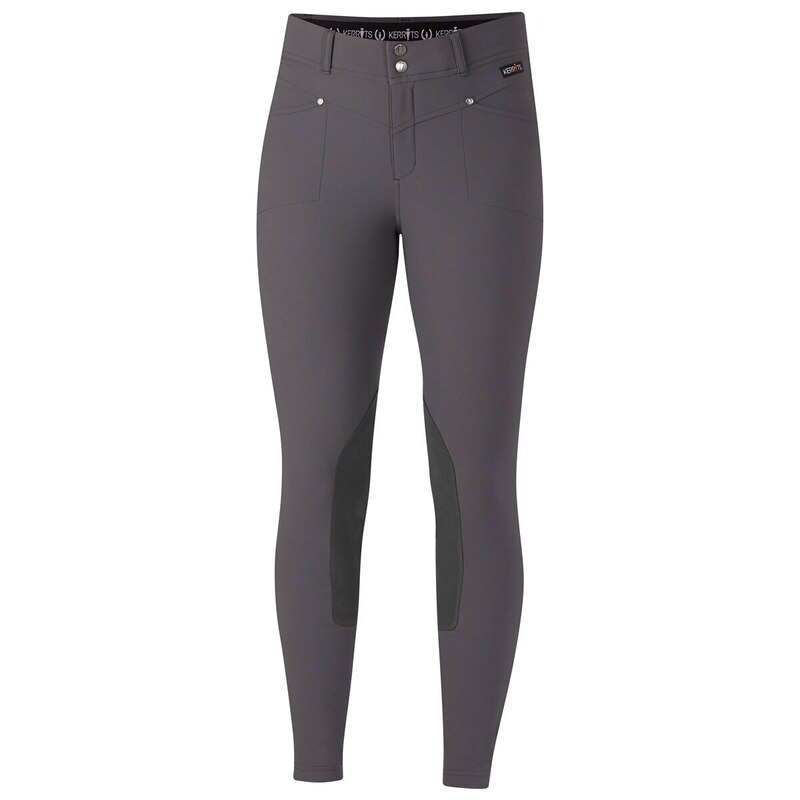 They are lightweight and great for riding in the summer but also quite flattering! The mid-rise is really nice and I would definitely buy another pair, I just wish there were more colours! Rated 5 out of 5 by tmd218 from Not quite as pictured, but amazing nonetheless! 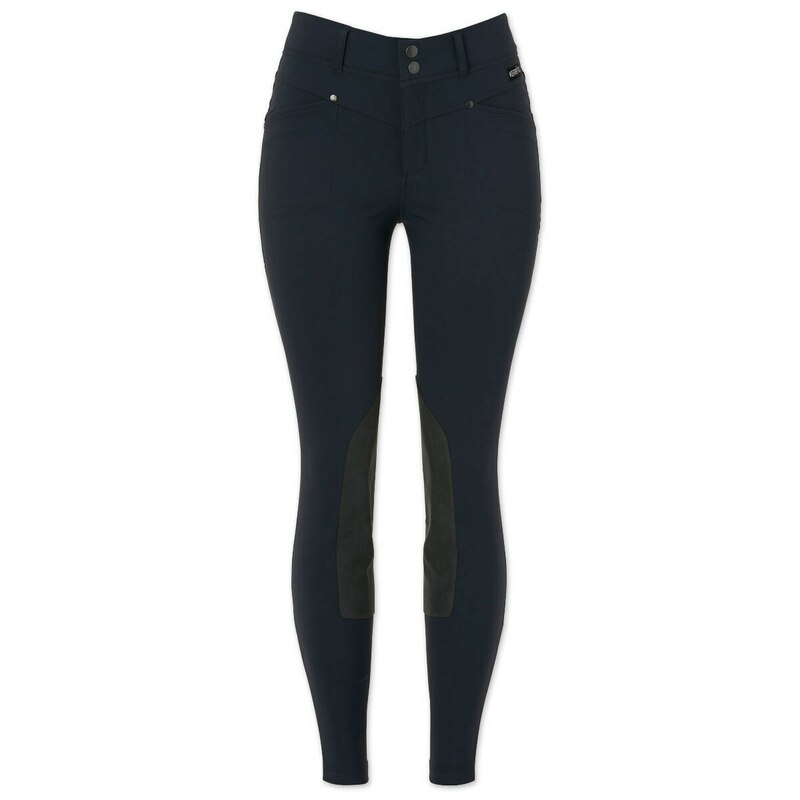 I LOVE these breeches. First: the acorn (dark brownish tan color) does not have contrasting knee patches. Everything is the same color. Not a deal breaker, though I wish they had produced them with stylish charcoal knee patch. That said, I love these (so much that I'd buy another pair if they actually made a contrasting patch color). They have a regular, natural rise waist that actually hits much closer to the belly button and is very flattering. The material is lightweight and breathable for hot rides, but it has enough thickness to conceal. I've tried other lightweight pairs and every bump and lump telegraphs right through. Others have written that the knee patches get sticky. This is true--they're weirdly not that breathable. For that reason, I think I'd avoid a full seat version of these, as I think it would be uncomfortable, but the slightly sweaty area under the knee patches didn't bother me, but I did knock the "quality" rating down one star. If they could be improved, it would be with a knee patch that breathes better while still gripping. I'm not a big fan of silicon "patches" and prefer the actual suede or Clarino patch, so this isn't a deal breaker for me. Great pants, great price, and really good looking. I've gotten TONS of compliments on the color and fit. Rated 5 out of 5 by Louisa from Love!! Bought these in the color ebony, size medium, and I love the color and the fit! They're a tad too short on me (I'm 5'11 so most breeches are) (except for my Kerrits Icefil tights surprisingly), but they fit great in the waist and are fairly breathable. I live in South Carolina, so these will be great in the heat and I'm considering wearing them to show in as well, they're a super nice quality (jumpers). Will definitely be ordering more! 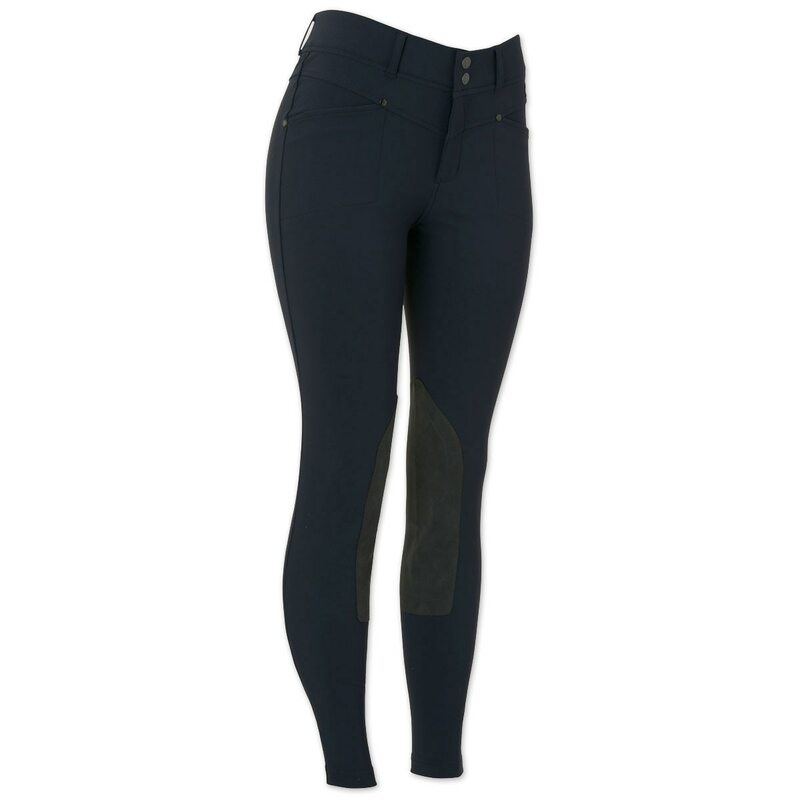 Rated 5 out of 5 by kmh2913 from Great fit Bought theses for show breeches comfortable stretch material. Going to buy more.